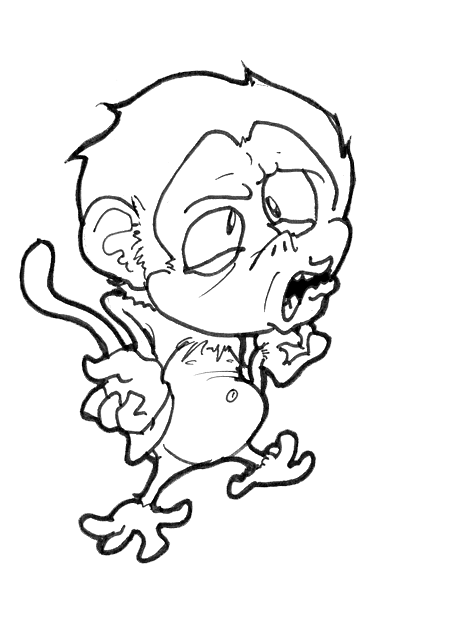 The first webcomic I posted (that I took seriously — none of that stuff on my first few sites) was Damn It, Monkey!. Back when this site was under apathyzeal.com, and only humor related items (none of this gaming stuff), I used it as a platform for launching Damn It, Monkey. Damn It, Monkey! was initially inspired from some late night session in my basement between a friend and I working on some bizarre contraption or something – joking as we built a fake TV set with a monkey puppet and on what that could eventually be. (Note we did all this knowing neither of us had any access to a camera). We never really got around to doing anything with it, but 5 or so years later, I started drawing again, heavily, as something amorphous– as in, I don’t remember and couldn’t tell you precisely what– had rekindled my love affair with cartoons. As I tooled with and reworked the initial ideas from several years before, I came up with a great idea for a satire of sitcoms. You know, in comic format, because that makes sense. Monkey was a parody of ALF, who instead of crash landing into a garage, crash lands into a basement. He’s super intelligent, but accident prone, and all of his inventions blow up. The father is a clear parody of conservative TV dads such as Red Foreman, Ward Cleaver, Jim Anderson… eh, you get the idea, and Rob the son, is your basic idiot. Stacy went through a couple of changes, from a depressed goth girl to an outright sociopath who nearly murdered others on a few occasions. She was actually my favorite character to write for, as the conflict between her and Rob was good, and frankly, I like dark humor. Mom herself went through several changes, too. Initially a flapper (the absurdity tickled me) and then an alcoholic, and then a regular, and then a general exasperated TV Mom in its initial run, and when I rebooted it on its own domain, a not-so-secret alcoholic again. Mostly done because I thought the initial character, while workable as a straight-man type, just wasn’t very interesting and a weak link in the comics. My biggest lament with Damn It, Monkey was rebooting it to begin with. I should have never, ever done that. The pacing was all off for a page-an-update serial, the serial format just didn’t work for its style of humor and the story was too weak to carry it (the comic was never about story), and I really couldn’t keep up with the schedule of regular updates (a flaw very common with every project I’ve ever done.) The character of Mom was the only real improvement. Squirt too – initially a simple youngster parody, and a vague, untouched parody of adopted children in sitcoms, I was able to touch on his character a little more in the reboot. This format worked much better for Damn it, Monkey! for several reasons. One, pacing. The humor just worked much, much better I feel – it allowed for 30 some pages of whimsy, no need for filler if I couldn’t keep up, and the pacing was usually spot on. It also allowed me to keep a running joke going and know exactly when it should end; the end of the episode. It was also just useful for not having to carry things over from one page to the next when the story did end. I hope sitcom writers know just how good they have it to have things happily reset after 30 minutes. As a note, I’d also occasionally sneak a few visual tributes to some cartoonists in some episodes, too. Slight references to the golden age of cartoons can be seen (notably Clampett and Jones), but also modern ones such a Jhonen Vasquez showed up, too. Unfortunately, a serial was just the wrong format for the comic when I rebooted it. Running gags could go on forever or die young, and each page really has to end on both a note that was intended to be funny, but wraps up the page, for the moment. I retooled the characters a bit, too, and while mostly for the better in some respects, Mandy and Rob’s relationship turned unintentionally into Billy and Mandy. I never watched the show too intently, and I never intended on this, but I definitely recognize those similarities. Frankly, if I ever re-re-booted it, I’d go back to something much closer to my original ideas. Not that I’m saying I would, but I’m saying I have thought about doing so a slight amount, and I stress slight. A serial works much better for what I’m doing with Ratboy – allowing for character development and a progression of a single linear story. Much, much better. And frankly, I need to keep going on that before I can think of working with Damn It, Monkey again, anyways.